The Roy Smeck series of Ukuleles were, in general, made by the Harmony Co. of Chicago. One of the most famous and desirable of these was the pear shaped VitaUke, with it's mellow sound and "barking Seal" sound holes. 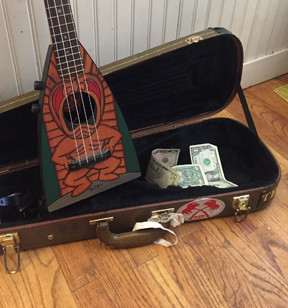 Smeck did however have other ukuleles, lap steels, and toy guitars made by other manufacturers who used his name and likeness on the instruments. Roy Smeck was a masterful musician, and was known as the Wizard of strings.